Since I write all over a book when I read, no one else can possibly use the book again but me. However, I make lists of various things I find in a book and among those are the “Good” and “Good Grief” lists. Because few things exist without a purpose, the reminders of being organized about one’s purpose is always profitable. It is also good to be reminded that we may become sluggish and stodgy in our ministries without realizing it and that programs should be tailored to fit the purpose. I was challenged by the book to think more of my audience while preparing as well as delivering a message. Church growth books are always good prodders of these things. Three statements of many on my “Good Grief” list are these. On targeting our evangelistic outreach Warren says we shouldn’t “just draw a bull’s-eye around whomever we reach and settle for that” (p. 155). In speaking of thinking evangelistically he says, “The problem is, the longer you are a believer, the less you think like an unbeliever” (p. 189). And in the always controversial area of church music he writes, “You must match your music to the kind of people God wants your church to reach” (p. 280). Having grown up in a mega church in Ohio, I have heard and seen this philosophy all my life. The specifics of what attracts a crowd today may differ, but the point is still the same. Today’s mega pastors survey their communities with more sophisticated tools, although I think yesterday’s mega pastors were more naturally gifted in that respect. 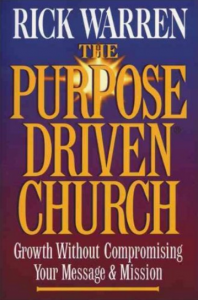 Warren’s basic premise is that the church is to be a place where unbelievers are comfortable and unthreatened and where their felt needs are met first, followed by the spiritual needs (p. 219, 226). The believers practice sort of an ebonics Christianity (my term, not his) to accommodate the lack of spiritual interest of the “unchurched.” Warren points out, for example, that Jesus fed the “unchurched” crowds as well as spoke to them. But he stops short of finding the church doing so in Acts or instructed to do so in the epistles. Every church that has grown as Saddleback has, wishes to claim that God has rewarded it because its love and compassion for people is unique, unlike churches that are not growing (p. 208-210). In addition they say, it must be obvious to the people who come that this church really cares more than others and so it keeps growing. This has always been the viewpoint of success in church growth. Would Jack Hyles or Jerry Falwell or Robert Schuler have claimed any different? It would be negligent not to take into account the purely pragmatic results of giving people what they want, something all of us have done to one degree or another. Among other things, Saddleback purposely meets people’s felt needs up front, makes the church service purposely appealing to the unchurched rather than the churched, and (this cannot be underestimated) “is unapologetically a contemporary music church” (p. 285). The issue that the reader must face is whether these types of methodologies are negotiable (not whether or not they work). If you are able to follow in the tradition and philosophy of the church growth movement while using nineties-type methodologies, this is the kind of book for you. If you were looking for something truly new or at least unique in its approach to church growth, this probably isn’t it.